This is a collaborative piece written by the members of group 3 from the International Teaching Human Rights class. The term “Environmental racism” is a form of racial discrimination in which environmental hazards specifically harm communities of color. A specific segment of the population is either deliberately exposed to an environmental hazard or they are left out from decision-making processes regarding environmental protections. 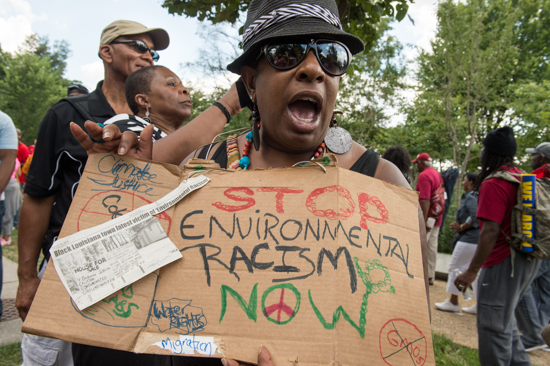 Environmental racism often occurs intentionally and disproportionately impacts communities of color and low-income communities. These communities often exist near environmentally hazardous areas due to forced relocations or systemic housing inequality. Recently, events in Flint, Michigan, where a predominantly black, low-income community was exposed to dangerous toxins in their drinking water, brought environmental racism to the forefront of American discourse. Other examples of environmental racism, specifically in the United States, include the systematic destruction of Native American land, the poisoning of Native Americans their reservations, African Americans in Louisiana’s “Cancer Alley,” and “pollution spillover” that affects Mexican-American communities located near the U.S.-Mexico border. These people all suffer from methodical victimization and exploitation by the government, the law and politics. To investigate environmental racism further - to understand how and why it gets implemented at an institutional level - we will examine two cases of environmental racism: one in Israel and one in the United States. First, we’ll turn to the situation of the Negev Bedouins in Israel. Since the last period of the Ottoman rule, the Bedouin communities in the Negev have been forced to abandon their traditional nomadic lifestyle in order to adapt to the sedentism of the modern world. With the establishment of the state of Israel, the majority of the Arab Bedouins living in the Negev desert decided to flee to Jordan, Gaza and other Arab countries. Those who chose to stay are supposed to be full Israeli citizens. They participate in the Israeli elections, and they even serve in the army. Yet, the coexistence of Arab Bedouins and Jews has led to a number of conflicts due to religious and cultural differences. In 1968, the state planned to build seven population centers, also known as townships, which had the purpose to concentrate the Arab Bedouins within these areas. Expecting to receive access to education, water, electricity and a health system, many accepted and resettled to the townships. Once moved there, they legally lost their lands and livestock – the very two things Bedouins as a shepherd community depend on. The loss of agriculture, along with financial instability caused by the state, led them into a state of poverty and misery. Most of the people living in those population centers are considered internally displaced persons. However, it is crucial to understand that these townships are officially recognized by Israel – other Bedouin villages are not. Unrecognized Bedouin villages, like Wadi el Na’am, can be characterized by the fact that the state has refused basic services to the settled community as a means of pressuring them into the townships and confiscating their land. They have been deprived of the right to water, electricity, clinics and schools. Moreover, the inhabitants constantly fear orders of mass demolition and active destruction of their agrarian fields. According to the Law of Planning and Building, a house can only be built once granted permission. As the necessary licenses are not granted in unrecognized villages, their houses may be legally demolished at all times. Najib Abu Arabiyeh, a resident of Wadi el Na’am, explains that these violent attempts to make the people leave have been dominating the village for about thirty years. Another method was to build factories right next to the community. Ironically, the ‘Israel Electric Company’ provides electricity to almost the whole country, except to Wadi el Na’am which is located only a few meters from the fabric. The same applies with the national water supplier ‘Makorot. The unrecognized village lies extremely close to the industrial zone Ramat Hovav, considered by many to be the most polluted area in the Middle East, and has, since its establishment, suffered from cancer and mortality rates that are 65% higher than any within a twenty kilometer radius. The whole industrial zone encompasses nineteen hazardous agro-and petrochemical factories and a toxic waste incinerator. Ever since it was founded in the 1970s, children living in Wadi el Na’am and other closely located villages, have been victims of the exceedingly high asthma rates and eye infections. A significant amount of the Bedouin women find themselves having abnormal many cases of miscarriages and the Bedouin’s main source of income, the livestock, has died from infections. Another instance happened in April 2003 when the association ‘Bustan L’Shalom, a grassroots human rights and environmental sustainability organization, decided to build a hospital in Wadi el Na’am after the people had been denied one by the Israeli government. The authorities had claimed that they did not want to put their doctor at risk of working so close to Ramat Hovav. So, the community managed to realize the project with the help of donations. Nevertheless, it was built without a required license, and although it opened in 2004, it may be subject to demolition at any time. 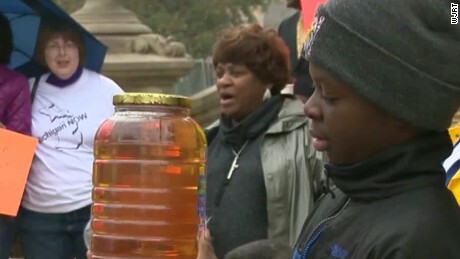 To examine a case of environmental racism in the United States, we turn to Flint, Michigan. Flint was a booming lumber and auto manufacturing town until the late 1980’s when the effects of disinvestment, deindustrialization, depopulation and urban decay took hold. A state of financial emergency was declared in 2002 and then again in 2011. In April of 2014, in an effort to save money, the state of Michigan made a decision that would change the lives of thousands of Flint residents and put their town in the headlines for months. When the state of Michigan took over Flint’s budget, they decided to temporarily switch the water source from Lake Huron and the Detroit River to the Flint River which had previously been a toxic dumping ground for General Motors. Residents immediately began to complain about the foul smelling water, rashes, hair loss, and other issues. Politician and city leaders assured the residents that the water was safe to drink, disregarding the clear indications that there was a problem. After the switch to the Flint River, Virginia Tech researchers found that water was highly corrosive and, in violation of federal law, the Department of Environmental Quality did not treat it, resulting in lead contamination and a legionnaires disease outbreak. Denial and negligence turned a bad decision into a tragedy for thousands of people, many of them children, and most of them Black and/or poor. Flint is 57% black, and more than 41% of its residents live below the poverty line. It’s clear that what happened in Flint was heavily influenced by the racial and socioeconomic demographics of its residents. According to Dr. Robert D. Bullard, Flint is just one of many cases of environmental racism in the United States. There are uncountable examples of minority towns and neighborhoods inundated with hazardous waste, lead and deadly chemicals. He offers the example of West Dallas, Texas, where a battery recycling smelter let out a ton of lead particles every business day that ended up in the neighboring blocks that were inhabited by Black and Latino families; Emelle, Alabama where incinerators and landfills for chemical waste were placed in minority communities with the worst in Sumter County where 9 of 10 residents are Black; Uniontown, Alabama, 90% Black population, where toxic coal ash was dumped in its Arrowhead Landfill; and the list goes on with examples of how low income and minority populations are exposed to unhealthy environmental conditions. Perhaps what is most appalling about these acts of environmental racism in Israel and the United States is that the environmental hazards that harmed these communities were perpetuated by the very governments that are supposed to protect them. This sort of environmental racism often violates what many people would agree are basic and fundamental human rights. In Human Rights: A Very Short Introduction, human rights are defined as “a rather special category of rights” that are based in “extraordinarily special, basic interests, and this sets them apart from rights, even moral rights generally.” Although there is not a complete consensus on what constitutes human rights, typically access to water, food, and a safe living environment would fall under this category. Environmental racism is not an issue that is specific to a single city or country, but affects minority populations around the world. Because of its global impact, it is important to recognize environmental rights - such as access to clean drinking water and protection from poisonous toxins - as basic human rights. Unfortunately, international enforcement of human rights has been historically weak, especially when sovereign governments - such as the United States’ government and the Israeli government - are perpetuating human rights violations. However, the growing visibility around these egregious instances of environmental racism will hopefully inspire greater action around the issue. Suppression of human rights in Europe and refugees: Are they the cause or just a symptom? Currently around 45,000 refugees and migrants are trapped within Greece. The number is a result of the blockage of the so-called Balkan route which was imposed just a few days ago by the government of the Former Yugoslavian Republic of Macedonia (FYROM) at its borders with Greece. The Balkan route was until recently used by refugees and migrants to reach northern Europe. The FYROM was followed by Croatia and Slovenia while the Serbian authorities also announced the taking of similar measures. Austria appeared to be blessing the actions taken. Albania and Bulgaria are doing the same now. Sweden and Denmark had imposed limitations on the refugees reaching their border prior to the above countries. Inside Greece, the debate over the refugees and migrants is focusing on the logistics for the handling of this immense problem (rather than on the medium- and long-term management of it): the creation of refugees camps or “hot-spots” across the country in order for the huge human inflows to be temporarily hosted, recorded and then either forwarded back to their countries of origin, in the event that they do not qualify as refugees, or be granted permission to remain in the EU and be allocated across the member states (Solution that is objected by many EU countries). Only in 2015 more than one million people made the “trip” to Europe. Around 4,000 of them died trying to reach the shores of Greece or Italy. Almost half of them are coming from Syria. This year appears to have started even more intensely with Greece having received almost 75,000 people by mid-February. However only a few of them actually wish to remain in the country. The Greek government has stated that Greece would admit and host as many as 180,000 refugees but this is highly doubtful given its economically dire situation over the past six years. I am not familiar with the refugee asylum system of Greece, let alone the dozen ones of the remaining of the European countries. So, I would avoid criticizing or being over-judgmental about their stance towards the refugees from a legal perspective (although, all intuitively I sense that they must be breaking their respective laws in this). My main concern here relates to the European Union as a political organization and in particular how the EU treats the people entering the Union as refuges or migrants. What these people are expecting from Europe and what they actually find when they cross its external borders and attempt to head towards their final destinations. Are there any impediments or limitations imposed on them and how these obstacles are conflicting with essential European values. What is the purpose of the refugees’ camps (hot-spots) and how their existence and operation can be reconciled with what Europe is supposed to represent when it comes to human rights? First of all, I should explain why I refer to refugees and migrants separately: The former constitute a very special category of people violently displaced from their home countries due to war, persecution or natural disaster. Refugees are understandably a very dear category of international humanitarian law. The same is not true for migrants, i.e. people who leave their birth place in search for a better life, usually in another country. The law is not as friendly to migrants as it is with refugees and it often sets very strict quotas for their admittance to the host state. I note here that article 2 of the Treaty on the European Union states that “[t]he Union is founded on the values of respect for human dignity, freedom, democracy, equality, the rule of law and respect for human rights, including the rights of persons belonging to minorities. These values are common to the Member States in a society in which pluralism, non-discrimination, tolerance, justice, solidarity and equality between women and men prevail. Moreover, Article 3 paragraphs 1 and 2 provide that “1. The Union's aim is to promote peace, its values and the well-being of its peoples, and 2. [t]he Union shall offer its citizens an area of freedom, security and justice without internal frontiers, in which the free movement of persons is ensured in conjunction with appropriate measures with respect to external border controls, asylum, immigration and the prevention and combating of crime”. Obviously, the European Union has statutorily put human rights at the center of its very foundations. It has also vested itself with the authority to regulate refugees’ asylum and immigration related matters and so the current crisis could be expected to be treated harmonically at a European level. But it is not. Instead we are seeing member states act with a view to protecting solely their own narrowly interpreted national interests against not only their fellow member-states but the people who are seeking asylum from them. In a sense we are watching the EU “publicize” to the world its lack of maturity and its unpreparedness to handle a situation which it has helped build in the first place by means of its unbalanced foreign policies. The images from the route of refugees from Syria to Europe are disheartening. Even more disheartening are however the ones taken on European land. How is it really possible to watch children, drowning in the sea and being hungry and totally unprotected from the elements of nature in the 21st century Europe? How inhumane is to see refugees beaten-up by border-control police or treated as dangerous criminals that must be kept detained and separated from the rest of society? Why EU governments do not stand against extreme-wing populists who attack refugees and migrants rather they are playing their game and bowing to their hostile screams and not opposing their rhetoric of hatred? What has made Europeans so scared and insecure about their own lives so that racism and hate against refugees and immigrants have lately nested into their hearts? And where is the respect for human rights and human dignity that the EU is built on? It must not be a coincidence that crossing the Atlantic, from the EU to US, we find strong parallels in the appeal of Donald Trump to some, mostly feeling socially marginalized, American citizens. What is making people aggressive to humanism? Are perhaps people losing faith to people as globalization proceeds favoring more some over others? The article attached here provides some thoughts on this that deserve looking at. I find this to be at least hypocritical. While the immediate need for any country to admit as quickly as possible and with the least hurdles possible any refugees asking asylum can be understood on a humanitarian basis, reality shows that the relevant procedures are full of red-tape and thus extremely slow and the treatment of these people receive is far from ideal. So their theoretical priority over economic migrants in practice disappears. On the other hand, migrants are predominantly people seeking a better future for them and their families and they usually arrive to the host country with the dream of finding a new hospitable home which they will respect while themselves being treated decently and with the dignity they deserve -but so often missed in their home countries. They might be punished by strictest immigration rules but are usually the ones that revive their new countries with their energy and passion to progress and be part of their foster societies. Read more about Suppression of human rights in Europe and refugees: Are they the cause or just a symptom? The article "Europe Refugee Crisis In Germany: Berlin ‘Losing Sight Of Human Rights", by Lydia Tomkiw deals with the refugee crisis and the high entry into Germany. Since our Chancellor Angela Merkel still represents "open-arms refugee policy", assaults on refugee shelters continue to increase: right-wing extremists and racists set whole refugee houses alight, stirring up hatred and violence among locals and refugees who are simply seeking shelter and desire to live a life in peace- without fear of malicious attacks.I consider this article informative and recommendable to read due to its realistic depiction of our political situation in Germany. It depicts important issues referring to the refugee crisis in Europe and gives a brief insight in this sadly on-going process of political unrest. No matter if one watches TV, reads a newspaper or follows the news online, the Syrian refugee crisis has been a ubiquitous topic during the last months in Europe. It is horrible to experience people’s despair and suffering when they try to escape the ever-lasting war in their home country. They are forced to leave their native country with nothing more than they are able to carry with them. What is even more, if they don’t die on their way to another European country they are confronted with many bureaucratic difficulties they have to cope with before being fully accepted in their new “home country”. The longer one follows the news, the more obvious becomes the question whether the refugees and their admission to other countries is actually only the task of some countries such as Italy and Germany or whether it should be a problem concerning the whole world. To say it bluntly, the world asks itself which stance the U.S. is taking in this issue. Germany and the U.S. were once seen as the world’s two largest recipients of immigrants; therefore, it is not astonishing that people in Europe – especially here in Germany – get kind of angry when they hear that the U.S. only accepted 1.500 Syrian refugees since 2011, whereas Berlin accepted 1000 of them in the month of July 2015 alone! When we searched for “the USA and the refugees” (a query without judging in any direction), one of the first things we discovered was the following cartoon, which is somehow speaking for itself and it does not need any further explanation. Of course, one could argue that there is the ocean as natural barrier between Syria and the U.S. Given this fact, the admission of refugees is not that easy in the United States, but in our opinion this cannot be the reason for the entire non-participation of the U.S. concerning the admission of more refugees. The U.S. government constantly opposes that it is their responsibility to stabilize the situation in Syria. For them it is no priority to take refugees in and help them to start a new life without war and fear – no matter how you look at it, the entire situation totally contradicts Obama’s widespread sentence “Yes, we can!” being said after his first election. To top this all, further military actions done by the U.S. government, as is very well known, turn out to be even more expensive than a resettlement of the refugees would ever be. Nevertheless, if one could believe in the promises of the U.S. to take in about 5000 to 8000 Syrian refugees next year, this numbers are still far too small for such a huge country. One might argue numbers do not paint the whole picture. Therefore, we aim to compare the situation in Germany and the U.S. in more detail now. According to Eurostat, 110.350 applications of asylum seekers were accepted in Germany. That is the highest rate of the EU altogether and almost three times more than in Hungary, which is ranked after Germany. Of course, one could go on and on comparing, but that will not stop the refugee crisis in the next years. It would become even worse for many European countries concerning available spaces and money. However, keeping in mind that we publish this blog on a Human Rights Website, it is very important for us to say that one should never forget that seeking asylum is a basic human right for everyone. Schuck, Peter and Rainer Münz. “’Paths to Inclusion’: The Integration of Migrants in the United States and Germany.” Migration and Refugees: Politics and Policies in the United States and Germany. Ed. Myron Weiner. New York: Berghahn Books, 1998. Vii. Weiland, Severin. “Die USA und die Flüchtlinge: Eine Supermacht versteckt sich.“ Spiegel Online Politik. 07 September 2015. Web. 13 December 2015. “Syrische Flüchtlinge USA.” Toonpool. 07 September 2015. Web. 11 December 2015. Thrall, Trevor A. „Let Syrian Refugees In—All of Them: Why resettlement is a cheaper, and morally superior, alternative to Western military action in Syria.” The Atlantic. 21 October 2015. Web. 14 December 2015. Ignatieff, Michael. „The Refugee Crisis Isn’t a ‘European Problem’.” The New York Times. 5 September 2015. Web. 14 December 2015. „Infografiken: Zahlen und Fakten zu Flüchtlingen in der EU.” Tagesschau. Web. 10 December 2015.